THE NATURAL HAVEN: Part 2 of 2: Porosity - Can you fix it? Part 2 of 2: Porosity - Can you fix it? No, when the cuticle sustains damage, this simply cannot be fixed. The cuticle does naturally thin down as hair length increases due to normal weathering (Journal of the Society of Cosmetic Chemists pg155-175, 1977). Broken, chipped or missing cuticles and cracks in the hair cannot be permanently fixed. Using hydrolysed protein can temporarily improve the hair but ultimately this is temporary. Q: Can you open and close the cuticles of the hair? This is NOT (I repeat NOT) the way the hair cuticle works. It does seem to imply that the cuticle is hinged like a door and can be raised without damage and then ‘closed’ back down. However this is not how it works. The cuticle can be raised slightly (it takes very sensitive instruments to detect this – the distance can be as little as one millionth of a meter). Running your fingers down a strand to feel for a raised cuticle is simply not possible unless you have severely damaged hair. Q: Can you stop the cuticle from being raised? Q: Does apple cider vinegar help to ‘close’ the cuticle? There is no evidence to support that pH (i.e low pH of ACV) can affect the hair cuticle in this way. High pH (9 and over) found during relaxing can raise the cuticle and even destroy the hair completely (J Invest Dermatol 105: 96-99, 1995). This study did also show that hair did not show any real change, meaning the cuticle was not raised or smoothened by exposure to a large range of pH values (about pH 4 to 8). Q: Does cold water help to ‘close’ the cuticle? Again there is no evidence to indicate this happens. Heat, even low heat with a blow dryer (70 degrees Celsius for 30 seconds) does raise the cuticle. You can see it for yourself in this paper which has a rather excellent image –see figure 4. There is no evidence that I could find that running cool/cold water over the hair impacts the cuticle in any way. I just wanted to let you know that the tip you gave about using the scunci headband is working for me. My scarf has not come off at night yet. Plus, I do not have to tie my scarf tight. This is SO helpful. I bough ACV and have been using cold water as a final rinse. It's good to know I don't need to do this anymore! I am not using silicones currently but I have been toying with the idea of integrating them back into my regimen and shampooing a little more often avoid the build up. This is a very good and informative blog. Thank you for taking the time. Very interesting...especially about ACV and cold water rinses. But now I think I'm more confused (science never was my strong suit). I've done ACV rinses and there seemed to be some effect to my hair and made it feel smoother. Why is this??? @Tracyata - I don't envy you and the decisions you have to make! I don't play by the curly rule book myself, I use my own hair as a guide, if my hair will take it then I use it! @Angela, there may well be something else in ACV causes the smooth feeling. From my research this is not likely to be the ph/cuticle line of thinking. Perhaps something else in it deposits onto your strands in the same way conditioner would to create the feeling of smoothness. I really don't know the answer and the only thing I am certain of is that research shows that low to slight basic pH has little effect on the cuticle. - Is a "raised cuticle" the same as a broken or chipped cuticle? Do you use those terms interchangeably? This is what I've surmised from your post (assuming "raised" means "damaged"). Is this correct? -A raised cuticle can be smoothed back down using conditioner, but not ACV rinse or cold water. -pHs do not raise the cuticle, but handling the hair (especially when wet) can raise the cuticle. Raised, broken and chipped are all different. They all mean exactly what the word says, therefore a raised cuticle is slightly lifted, broken means a large part of the cuticle layer is missing but there is something still left on and chipped means there are slight bits of the cuticle that are missing but most of the cuticle is still intact. A missing cuticle is missing! A raised cuticle is damaged and can be smoothed back down with conditioner. Sorry to be very scientific on this one but I have to be clear - I do not know if ACV can smooth the cuticle back down. I do know that the assumption that it does so because of its pH is probably wrong. There is no research that I could find to show what happens to hair treated with ACV, so I cannot absolutely say that ACV does not smooth down the cuticle. I can say that the pH theory is wrong. Last statement on pH 1 to 8 is spot on!Relaxers at pH 9-10 do affect the cuticle. Do protein treatments help with porosity at all? Great question! - Yes hydrolysed protein can temporarily patch up the hair where the cuticle is missing because it is attracted to keratin. This is a great post. "Another myth bites the dust". For all that I totally agree we should do what feels right on our hair. I guess my point is if people are happy using AVC, etc so be it but it's great we don't have to use it if we don't want to. so is it a myth that we should rinse with cool water when using a porosity conditioner like roux porosity control? I can only say that I can't find evidence of this. I therefore cannot definitively say that it does or it doesn't. It needs to be researched and proven. I would also always say follow the manufacturer's instructions. So if protein treatments can help porosity what about henna? On the pH theory: Why are so many focused on pH? Acidic products for closing the cuticle and basic products(like baking soda) that close it? Ans also about pH balance, with products that are geared toward pH balancing the hair? I mean it seems to make sense that if something basic, i.e. relaxer, raises the cuticle then something acidic enough should close it. But I guess the research doesn't support this, Oh confusing. Additionally, I was under the impression, perhaps falsely, that porosity was something genetically based but that could also be affected by the things we do to it and the environment. Was this also wrong? 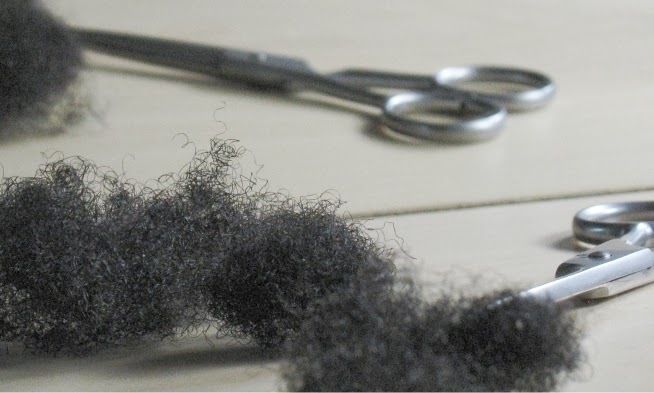 What is high or low porosity hair and how do you treat it. Based on the water strand test it seems like my 5 year old has low porosity hair. when placed in water it never sinks to the bottom and just floats on top. her hair is dry alot and never seems to get moisturized.